Diesel prices continued to increase over the past few weeks, starting the month at an average $3.086 per gallon, according to the Energy Information Administration. The average price has increased 11 cents since the start of the new year, and almost 2 cents since last week. This price is also about 53 cents higher than the average price a year ago this week. Echo – What does it mean? Bats use echoes, the repeating of sound as it bounces off a surface, to see. We can only see our future by keeping up with industry news and supporting our clients. This news is “echoed” in our blogs. 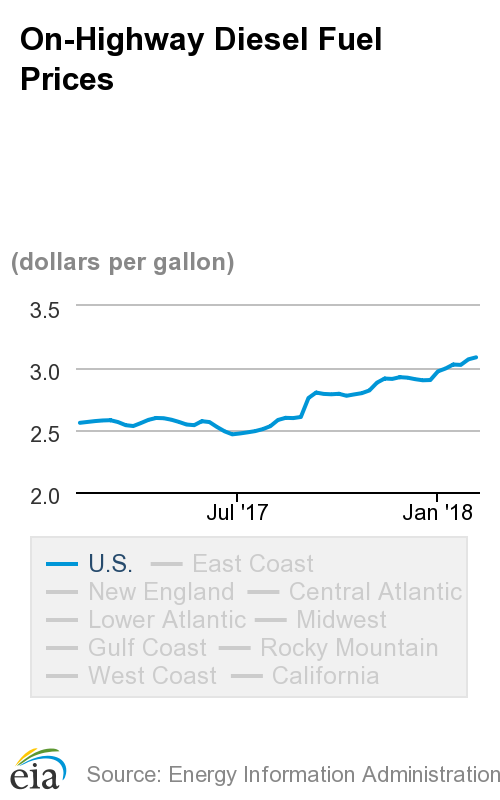 After steeply climbing since summer, diesel prices are starting to level at an average $2.922 per gallon. Last week, the average price was $2.926 per gallon, according to the Energy Information Administration. Average prices were $2.912 and $2.915 per gallon the two weeks prior. The average price is still 44 cents higher than the average price a year ago this week. The lowest average price per gallon this year was $2.465 the week of June 26. Diesel prices spiked through the month of October, and started the first full week of November 41 cents higher than the average price last year this week. The average price per gallon is $2.88, according to the Energy Information Administration. The average price dipped slightly the week of Oct. 9 to $2.776 per gallon, but has climbed ever since. The biggest jump in price was this week at six cents. With BTU’s high powered freight rate tool and carrier pairing, BAT can benchmark pricing that doesn’t satisfy their customers with pricing that does satisfy and still provides capacity. In essence, BAT is turning losing freight rates into winning freight rates by adjusting their margins and carrier relationships. Another major value for BAT is in seconds BTU identifies BAT’S best carrier that’s available for the chosen lane. It’s been a way for BAT to keep ahead of the market trends and position themselves ahead of the market’s supply and demand. BTU is a freight rate tool that uses Microsoft Azure machine learning, predictive analytics, and artificial intelligence to give brokers the ability to find the right rates that provide accuracy and high margins. After jumping about 15 cents as a result of Hurricane Harvey in late August, the national average for diesel fuel prices hovered at the $2.80 per gallon. At the start of October, the average price is $2.792 per gallon, according to the Energy Information Administration. The high the year so far was reached in the Sept. 11 update, which had the national average at $2.802 per gallon. The average price was the lowest for the year at $2.465 in June. This week’s average price is 40 cents higher than the average price a year ago this week. – There are 3.5 million truck drivers in the United States. – Truck drivers drove over 279 billion miles in 2014 alone, according to the American Trucking Association. – The median annual wage of a truck driver is $41,340, according to the Bureau of Labor Statistics. – Truck drivers’ crash rate is 29 percent lower than other drivers, according to the Federal Motor Carrier Safety Administration. – Just about every good consumed in the United States was on a truck at some point, according to the ATA. Be sure to thank a truck driver this week. 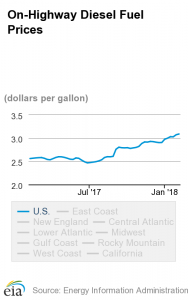 Diesel prices marched close to the year high over the past month, increasing to an average $2.581 per gallon by this first full week of August, according to data from the Energy Information Administration. The highest average price for the year so far is $2.597, which was hit both in January and April. It didn’t help that the average price climbed five cents in just the last week. Since the end of June, the average price has increased about 12 cents. Prices are about 27 cents more than prices a year ago this week.